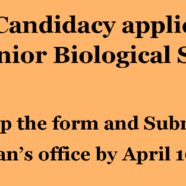 Students who are majoring in Biotechnology or Biological Sciences, who are interested in being a part of Senior Biological Society Team ‘14, can get the application form from this link, fill it out and submit it to Dr Irfan’s office by 16 April. No applications will be accepted after the 16th. Dates for interviews will be announced after Easter Holidays. So please keep track of the dates; if you miss your interview date, no rescheduled date will be given.